Only Club Members (i.e. members who have paid their subscriptions) may enter competitions. All competitions are open subject, unless otherwise noted in the Programme. Entries for both Print Competitions and PDI Competitions must be submitted via the competition software (Photoentry) by the date given on the Programme. Late entries will not be accepted. An outside Judge will judge competitions unless otherwise stated in the Programme. All entries, whether Print or PDI, must be numbered in order of preference, as one or more submitted entries may be taken out if there are too many entries on the night. For example all 4th and 5th preferences may be removed. Entries already submitted for one round may be submitted in later rounds once only, provided that the image has not scored a 20, in which case it cannot be resubmitted for further general competitions. Entries submitted for Print Competitions may subsequently be submitted for Projected Image Competitions, and vice versa unless that image has scored 20 in either competition. Entries submitted to the Print or Projected Image special end of year competitions cannot be resubmitted in any following competitions, , irrespective of score. In addition, all entries for end of year competitions must have been entered in a competition that same year. Entries for Prints or PDIs can be recent or older images. There is no time limit. All images, or elements within that image, must be the original work of the author, unless otherwise stated in the competition. Copyright remains with the author. However, by entering a competition, the author grants Uckfield Camera Club permission for an image to be used for promotional purposes i.e. placed on website or social media. Entries sent without the correct information on the back of Prints, or without the correct information sent with DPI images, will not be accepted for entry. WHILST THE COMMITTEE WILL TAKE EVERY REASONABLE PRECAUTION, IT WILL NOT ACCEPT LIABILITY FOR LOSS OR DAMAGE TO PICTURES OR ELECTRONIC FILES WHILE IN ITS’ CARE. A maximum of 5 prints may be entered for Print Competitions. However an overall maximum of 65 prints will be entered, at the discretion of the print Leader. Therefore, order of preference is essential on the label in order to ensure the author’s priority of submission is taken into account. All images must be mounted and can be trade or homemade mounts. The maximum entry size, including mount, must not exceed 40 cms x 50 cms. Entries may be colour or monochrome, unless stated otherwise in the programme. A digital version of the image should be entered into the PhotoEntry competition software by the deadline specified. Please note that the print will not be entered into the competition unless a digital version is received. A maximum of 5 JPEG files per author may be submitted for the Projected Image Competitions via the competition entry software (Photoentry). However, an overall maximum of approximately 60 to 80 images will be entered for each competition, at the discretion of the PDI Leader, who may also consult with the judge if appropriate. Images should be in JPEG format, sRGB colour space, with a MAXIMUM dimension of 1600 x 1200 pixels (ie. 1600 pixels for the width x 1200 pixels for the height). For example: The horizontal axis cannot exceed 1600 pixels and the vertical axis cannot exceed 1200 pixels. 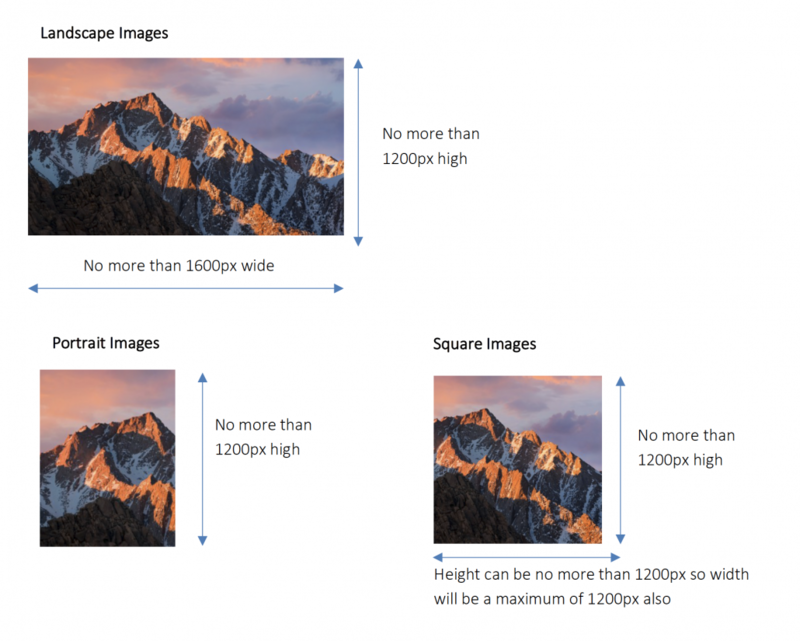 Therefore a square image would have maximum dimensions of 1200 pixels by 1200 pixels. 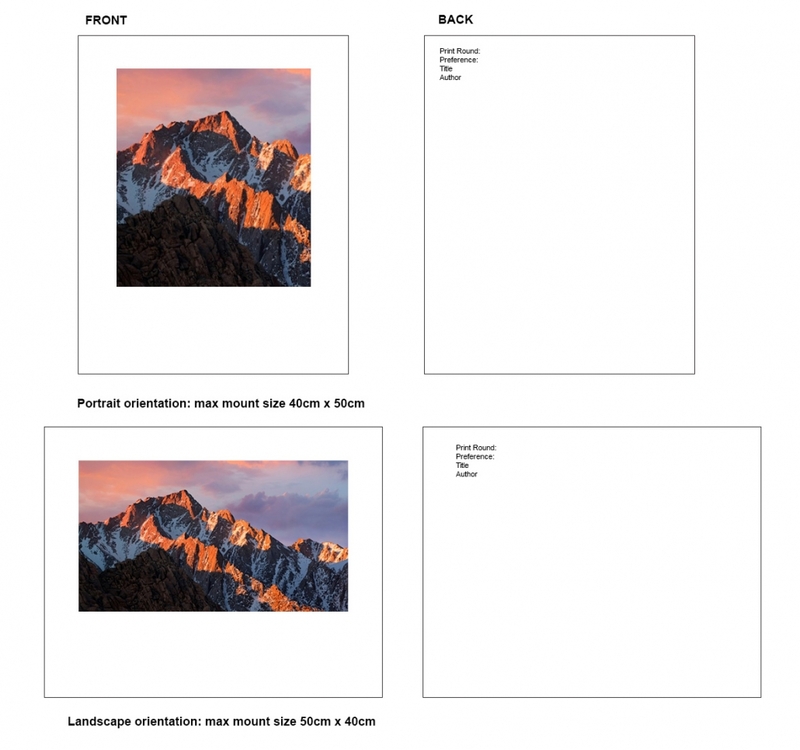 A portrait format image would have a maximum vertical size of 1200 pixels, making the horizontal size smaller than 1600 pixels. A landscape format image would be 1600 pixels horizontally and no more than 1200 pixels vertically (see example images below).